MISSISSAUGA, ON, May 17, 2012 /CNW/ - Just as the first long weekend of summer approaches, one of Canada's most celebrated cola events is back and bigger than ever, providing Canadians with an entertaining and refreshing way to quench their thirst all summer long while letting their taste buds decide. Today, PepsiCo Beverages Canada announced the return of the Pepsi Taste Challenge (#PepsiUTC) - an iconic grassroots campaign that forever changed the face of consumer marketing when it debuted almost 40 years ago. Pepsi first challenged consumers to take a blind taste test to reveal their cola preference in 1976. The campaign quickly became a success as the company uncovered that more Canadians preferred the taste of Pepsi, even if they identify themselves as regular Coca-Cola purchasers. Nine-million taste challenges later, the 2012 edition is called the Pepsi Ultimate Taste Challenge and boasts world-class innovation with new, cutting edge technology, a one-of-a-kind Ultimate Taste Challenge big rig truck that is touring the country, and regional executions at more than 1,000 events coast-to-coast this summer. The program's technology, coupled with its massive footprint, will enable Pepsi Beverages Canada to bring the Pepsi Ultimate Taste Challenge to 1.5-million Canadians across the nation - a record milestone for the company. "Canadians love programs that allow them to experience brands in unexpected and entertaining ways. Every few years we bring the Pepsi Taste Challenge in and out of the marketplace, always adding new elements to keep it fun, fresh and exciting," says Robb Hadley, Director of Marketing, PepsiCo Beverages Canada. "Pepsi has always been about taste, and given the choice, results of prior taste challenges consistently revealed that a majority of Canadians preferred the taste of Pepsi over Coca-Cola. We are excited to be back with leading edge technology and an increased accessibility that will offer consumers one of the most memorable taste challenges yet." 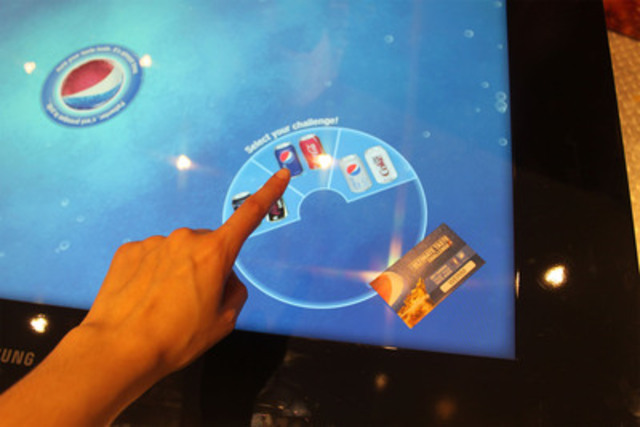 Pepsi is the first brand in Canada to implement Samsung SUR40 for Microsoft® Surface® for a consumer engagement campaign, a device that sees and responds to touch and objects on a 40-inch, high definition, multi-touch screen. The integration of this technology allows up to six consumers to experience the Pepsi Ultimate Taste Challenge at the same time in a new, memorable and exciting way. Also new to the Pepsi Ultimate Taste Challenge is the opportunity for Canadians to conduct the challenge with their choice of three of the company's biggest brands - Pepsi, Diet Pepsi and Pepsi MAX. This summer, the Pepsi Canada Facebook page (Facebook/PepsiCanada) will feature exciting content including an infographic that showcases real-time challenge results coast-to-coast, schedules of upcoming sampling events, and an online game where consumers can compete in daily challenges for their chance to win weekly prizes including tablets, LED TVs, smart cameras, home theatre systems as well as a grand prize that includes $5,000 cash. Grocery retailers are also embracing the program, staging Pepsi Ultimate Taste Challenges at retail locations. Heralding the Pepsi Ultimate Taste Challenge's return are two television commercials depicting cola drinkers being surprised when they trust their taste buds. The first, a 30-second spot called "Earl 2.0", will debut on Sunday, May 20 during the 2012 Billboard Music Awards. The ad features a Coca-Cola truck driver getting stranded on the side of the road. He is offered a ride by the Pepsi Ultimate Taste Challenge team and after accepting, he decides to try a forbidden Pepsi. The driver enjoys the beverage so much he gets a Pepsi tattoo to the dismay of his management. "Earl 2.0" was created and produced by BBDO Toronto. 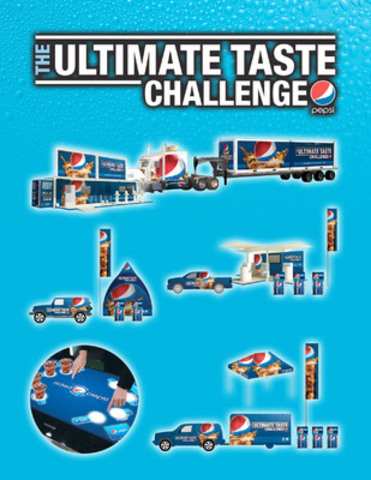 Technology partners of the 2012 Pepsi Ultimate Taste Challenge include Samsung Canada and Rogers Canada.